Brunch 11 a.m. - 1:30 p.m.
Pauli Murray College is located on the northern side of Yale University’s main campus in New Haven at 130 Prospect Street. The college is bordered by Benjamin Franklin College to the south, the Yale Health Center to the west, Ingalls Rink and Sachem Street to the north, and Founder’s Hall and Prospect Street to the east. As you walk down to main path from Prospect street, you will approach gothic archway on your right, enter the large gates. About a quarter the way down on your left, you’ll go through two large wooden doors which will be the dining room entrance. Built in 2017, Pauli Murray College honors Anna Pauline “Pauli” Murray, a remarkable civil rights and women’s rights advocate, who contributed immensely to the dismantling of segregation and discrimination. Pauli Murray pioneered a vision for a society that valued diversity and rallied around our common human virtues. Pauli Murray College vision is for a better society through its community members and its commitment to promoting diversity and inclusion. Pauli Murray served as an incredible leader in the civil rights movement, showing incredible bravery, persistence, and diligence in her pursuit of an equal society. Her amazing story and achievements continue to inspire the work of many scholars and activists today. Pauli Murray is an inspiration to continue the struggle for equality and justice today, as she tirelessly did during her life. 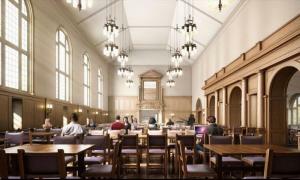 Pauli Murray dining hall seeks to create memorable experiences through education, engagement and excitement. Our purpose, is to tell the story behind the food. To provide first class experience and in the process, engage our guests and build new traditions. Students along with our employees will be engaged in the entire process of creating innovative, healthy and wholesome food. New food concepts embrace flavors from around the world. We will Focus on the simplicity of comfort foods from different ethnic backgrounds, keeping in mind the importance of sustainability and health and wellness.